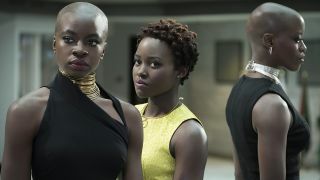 Okoye and W’Kabi trade insults in this cut scene. Marriage is a sacred vow. In life and in death, to have and to hold, arguing over extraditing a war criminal after your King has been deposed yadda, yadda, yadda. Try telling that to Black Panther married couple Okoye and W’Kabi, who – in this brand-new deleted scene – engage in a big ol’ slanging match. The 90-second scene in question, revealed by USA Today and one that you can watch below, sees Okoye and W’kabi come to terms with T’Challa’s supposed death at the hands of Killmonger. It also gives some much-needed depth to a deeply underappreciated character in W’Kabi. Okoye not only outlines her love for Wakanda, she also talks kids; namely, her own potential offspring. That forces W’Kabi, who was none too happy after the botched extradition of Ulysses Klaue, to relent and end the argument by giving his wife a tender kiss on the forehead. D’aww. While the emotions were running high in a scene that would’ve added a little extra to characters that tilted on the periphery a little too much for my liking, it’s clear why this didn’t make the final cut. It’s a little too indulgent after what was a hugely dramatic scene and, while Okoye and W’Kabi’s dreams for the future may differ – possibly hinting at a plot thread in Black Panther 2, who knows? – it’s territory that we don’t need to cross just yet. Still, it’s a great little scene, and credit to Danai Gurira and Daniel Kaluuya for really bringing their A-games. Even without that deleted scene, the movie had so much to talk about. Like EVERYTHING to do with the Black Panther ending.